Explanation: Fireworks came early on July 4th when, at 1:52am EDT, the Deep Impact spacecraft's probe smashed into the surface of Comet Tempel 1's nucleus at ten kilometers per second. The well-targeted impactor probe was vaporized as it blasted out an expanding cloud of material, seen here 13 seconds after the collision. The image is part of a stunning series of frames documenting the event from the high resolution camera onboard the flyby spacecraft. Tempel 1's potato-shaped nucleus is approximately 5 kilometers across as seen from this perspective. 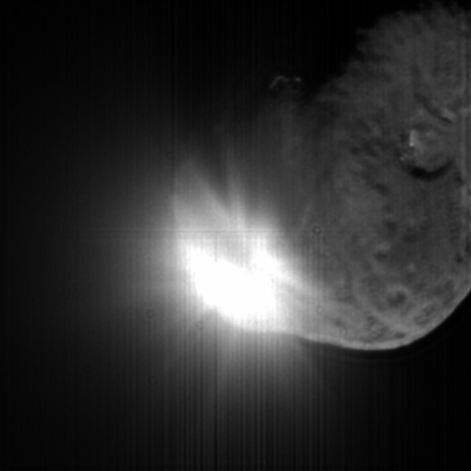 Cameras onboard the impactor probe were also able to image the nucleus and impact site up-close ... until about 3 seconds before the impact. Of course, telescopes nearer to planet Earth followed the event, detecting a significant brightening of comet Tempel 1.